Employee engagement is the buzzword when it comes to business success. Organizations want their employees to be engaged in all aspects of work. Research indicates that highly engaged employees contribute to the financial growth and are less likely to leave the organization. Engagement is crucial for the success of online training initiatives as well. So, how do you ensure employees are engaged with training? What are the solutions that will make them embrace training? 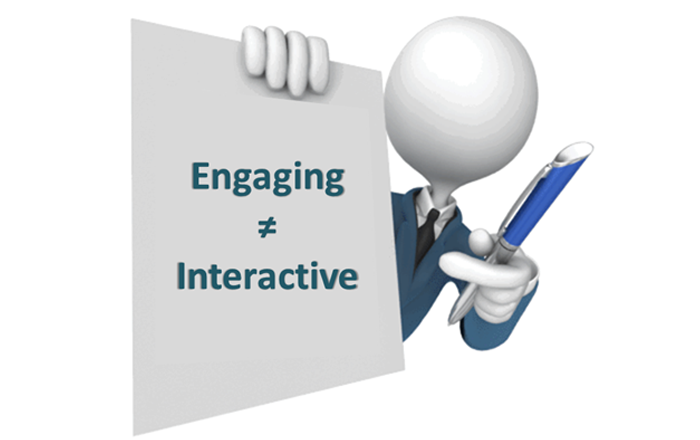 E-learning courses must have interactive elements to engage employees. In this blog, we will have a look at some of these interactive elements. Real life scenarios are one way to engage learners. They emphasize the learning objectives and take the learners through a near-life experience, making learning memorable. They add realism to the course by narrating individual human experiences or a slice of reality that learners can relate to. Scenarios are the best when you want learners to perform and learn, rather than just informing them. As for the interactive element in scenarios, choose characters that learners can relate to and give them the option of choosing the path the character takes, through questions and answers. Learners should be shown how their decision affects the outcome. Including dialogues in the scenario can make it more realistic, providing an immersive experience. Scenarios must be realistic and informative and at the same time, simple and straightforward, to avoid information overload. Here is a screenshot of a scenario, used in a course to teach effective sales skills. What is it with gamification that adds to the interactive element in an e-learning course? Gamification is the process of applying gaming concepts and designs to training so that it is more engaging and interesting. The points, badges, and leaderboards that are part of gamification encourage healthy competition among employees. Gamification allows employees to be in control, be self-directing and encourages the discovery of knowledge through exploration. In short, it is learner- centric. When learning is packaged in an attractive way through gamification, learners participate in the learning and the result is increased engagement. Check out these samples of gamified courses and discover ways to use gamification in your courses. Earlier, interactive videos meant using them for branching scenarios, where different video clips are run and the storyline changes according to the choices made by the learner.Today,interactive videos have acquired a new shape. Interactive videos now offer an immersive experience. Apart from branching, they include embedded hotspots, which can be clicked to open other elements such as videos, animations, or questions. These videos can be used for a number of purposes – learning a process, role-plays or simulations. These videos can solve learning challenges by using video-based simulations, reconstruction, or footage of real incidents.Videos allow learners to tailor the experience, apply knowledge, test it, and even make mistakes, without worrying about the consequences. It offers them an engaging experience because it is real and credible, and requires their inputs. Read more about using videos to improve your online training in this comprehensive eBook. This means making the course accessible not only on desktops and laptops, but also on tablets and mobile devices. According to a white paper by Cisco, there will be 1.4 mobile devices per capita. This indicates a trend where learners will be using multiple devices sequentially, to complete a learning task over time. This means using mobile devices that will provide bite-sized learning to employees. The learning should be simple, fast and quick. It should support the just- in- time training needs of learners. It will help learners learn at their pace and on the go.This convenience will make learners interested in the course, but to sustain it, interactive elements have to be included. This requires an innovative approach to design and course navigation that will support a responsive design layout. Have legacy Flash courses? Make them compatible with multiple devices. Read how. Employees will be motivated to learn if the course is customized to their requirements. This can be done by choosing interactivities based on what learners know or do not know. Interactivities such as a learning activity that will determine what learners already know and then determining the path the learner will take in the course based on his knowledge, is one kind of customization. Learn more about custom e-learning in this handy guide. Feedback, in the form of assessments, can be made interactive. When a learner clicks the wrong answer, he is told why it is wrong and given a chance to retry. Similarly if his choice is right, he is told why it is right. Quizzes at the end of each session will allow learners to assess their progress. This will break up content, keep away monotony, and promote learner engagement. To know how assessments can be used to measure training outcomes, download this eBook. Interactive elements in your e-learning courses will motivate your learners to finish their self-paced training and boost organizational learning. Explore the options discussed in this post and attract your employees to your online learning initiatives.